Watch Artificial Intelligence Lose Its Mind While Watching Bob Ross #ArtTuesday « Adafruit Industries – Makers, hackers, artists, designers and engineers! You’ve been mellowed out by the ASMR tingles of Bob Ross. 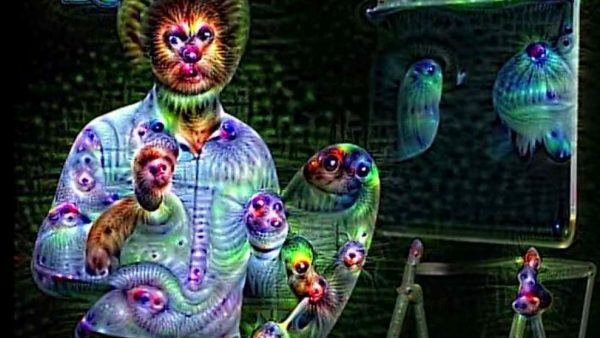 And you’ve been seen the disturbing Cronenberging of internet images by DeepDream. But what happens when DeepDream is asked to draw some happy little trees? Gut-wrenching head-trips. Because DeepDream doesn’t see happy little trees. Deep dream sees deeply artificial trees — via IFLScience! DeepDream is a convolutional neural network, a style of computing inspired by the brain, that identifies and recognizes images and patterns. Most of the time, it’s used to create nightmarish visions like these, but it’s also a surprisingly insightful visualization that shows how computers “think” in regards to tasks like image classification and speech recognition.